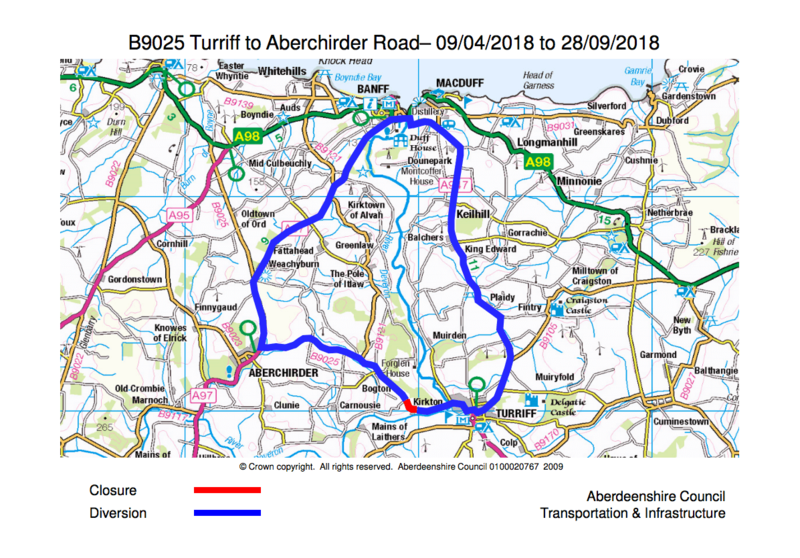 The B9025 Turriff to Aberchirder road is to be closed for two weeks from Monday 30 April until Sunday 13 May for surface dressing preparation works. There has been some concern from people who use this route on a daily basis that it has not been publicised by the council, the map below has incorrect dates on it and only appeared on the council website on Friday. An email seen by My Turriff implies that the road will be fully closed and not subject to the usual off peak day time closures. Unfortunately the road closure will be in place for 24 hours. Due to the nature of the works, there will be times in which there will be open trenches overnight and we cannot permit traffic through to negotiate their way through this. We will do as much as we can to open it in the evening, however certainly for the first couple of nights this won’t be possible. I’m also hopeful that the works won’t take the full two weeks but at this stage I can’t guarantee that this will be the case. With regards to the school buses, they have to follow the diversion as well due to the reasons above and I’m sure you can appreciate that we do take this into account when planning our closures. We try and make every effort to keep everything moving as normally as possible, but there are occasions such as this where it is difficult for us to do this due to the work undertaken and the diversion available to us. I can keep you updated with the situation as our works go, and if that would be of any help to you please let me know, and I can only apologise for the inconvenience this will cause. If you have any further queries please don’t hesitate to get in touch.